Do you ever wake up look in the mirror and think I look rough? If you don't well done your doing something right, keep up the good work. Well since I've had a baby and been starved of sleep I frequently look in the mirror and think just that; black bags that you could take to Waitrose to save 5p on your weekly shop and unkempt locks that Medusa would be proud of, which is appropriate as at present I could turn anyone looking at me to stone. But with a return to work coming up in the not so distant future I thought it was about time that I pulled myself together and at the very least tried to go some way to remedy the situation so as not to look like a Halloween extra. Now we all know that my beauty regime is hit and miss. Those of you shouting in the back row that I don't have a beauty regime, pipe down. As a parent I don't have hours to beautify myself, it has to be quick and more importantly worth my expense. As you know I've been loving the Sunday Riley Good Genes, if you haven't read my review pop over here and take a look. I generally steer clear of products that are over hyped, often being disappointed by the over inflated claims that don't live out to be true in real life. Trialling the Sunday Riley Good Genes however reminded me that sometimes the hype is worth all the glowing reports. I will most definitely be repurchasing this product. 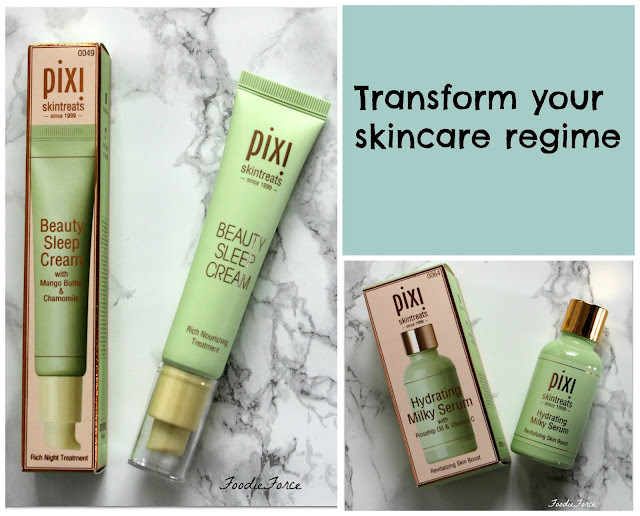 So with this in mind and having learnt a lesson; when I saw that Beth from ToastyWrites had tried some of the Pixi products which I have been lusting after for a good while, I thought to myself I would give some of their moisturising products a go. The first thing I noticed on opening this delight was the wonderful smelling Jojoba and Geranium. The serum is superbly absorbent and sinks in effortlessly. It did a great job in only a short amount of use to moisturise and revitalise my skin so that it looked dewy and healthy again. The product however is thick and I found the pipette absolutely useless in dispensing the product. In fact it is not designed for the purpose and use intended. I ended up using the product straight from the rather cheap appearing container and in turn used far more than was needed. But that said I enjoyed the product and would happily repurchase as my main moisturiser. I am not great at moisturising my skin so a product that I can leave over night to work its magic is really appealing. I have really dry skin so the addition of mango butter and lavender made my skin silky and as the consistency is not to thick, goes a long way and is easily absorbed. The Pixie skintreat products I tried I'm not sure would transform your skincare routine, however, they were nice to use and I would recommend having a try of them or start hinting to your other half/friend/family to add them to your Christmas wish list as a rather nice stocking filler. Using them has got me intrigued to try the other Pixi products on offer. Have you used Pixi and do you have any recommendations for me to try next?